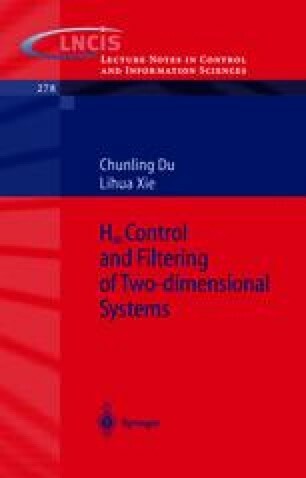 In this chapter, we develop a 2-D filtering approach with an H ∞ performance measure for 2-D discrete systems described by the 2-D FM LSS model . We consider both the finite horizon and infinite horizon filtering problems. Based on the 2-D Bounded Real Lemma developed in Chapter 2, we first study the finite horizon H ∞ filtering problem. It is shown that the finite horizon H ∞ filtering problem is solvable if a 2-D Riccati difference equation admits a positive definite solution. The result extends the well known 1-D H ∞ filtering result to the 2-D case. Furthermore, we shall develop both a Riccati inequality approach and an LMI approach to the infinite horizon H ∞ filtering problem. Two examples will be given to illustrate the applications of the results. The first one is on a stationary random field in image processing and the other on a 2-D digital filter.